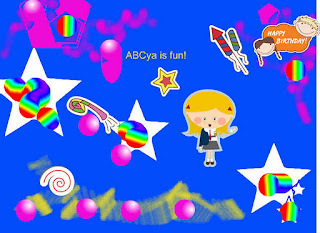 ABCya is a website with lots of educational computer games for kids. Children can play them online, but you can also download some as apps for iPad, iPhone etc via the iTunes App Store. Games are sorted via grade level (K-5). The K letter games are mostly about the alphabet, with letter matching, connect the dots etc, but there are also books to read and a keyboard practice game, basic enough for five-year-olds. Books, such as Lily the Wild Cat, can be shared with a class via an interactive whiteboard. There are also K number games involving simple counting, and some creating games where kids can make cars, houses, robots, faces etc by dragging elements to create something of their own. As you would expect, new and more age-appropriate games are introduced in each grade. Grades are divided into letter games, number games, more games, holiday games and a few games just for fun. The games are free. There are ads on the website, but that's the trade-off for the games being free. I like that the graphics are simple and colourful, and that the games are neither violent or boring. (The latter depends how sophisticated your kids are I guess - this chook falls into the not-sophisticated game playing class!) I also like how some creations can be saved to a computer, and others can be printed. This means some ABCya creations could be prompts for children's own writing. The games work well, there are lots of them, and the controls are intuitive. Be sure to have a good look around with your kids so they can find something perhaps a little challenging that they enjoy. Word Clouds for Kids is a simple word cloud tool where kids can enter their own words and generate a graphic representation of them. They can tweak the result according to font, colour and layout. Letter Blocks is great. "Create as many words as possible by clicking and connecting letter blocks. The more words you spell, the more points you get. A fun way to practice spelling too." It's fast, but I think Grade 3 and up could do it because words can be as few as 3 letters long. Tower of Hanoi is an online version of the board game or puzzle you might know. It's an excellent game for developing strategy skills.